SCVHistory.com AP2331 | St. Francis Dam Disaster | St. Francis Dam Under Construction, 1924-1926. Ranchers in the Owens Valley didn't take too kindly to the aqueduct that drained their underground springs and diverted water to Los Angeles. By 1924, the predecessor agencies to the city of L.A.'s Department of Water and Power had experienced several instances of sabotage. The St. Francis Dam in San Francisquito Canyon was intended to serve as a backup supply in case the flow of Owens Valley water was interrupted. Construction began in August, 1924. Water began to fill the reservoir above the dam on March 1, 1926. 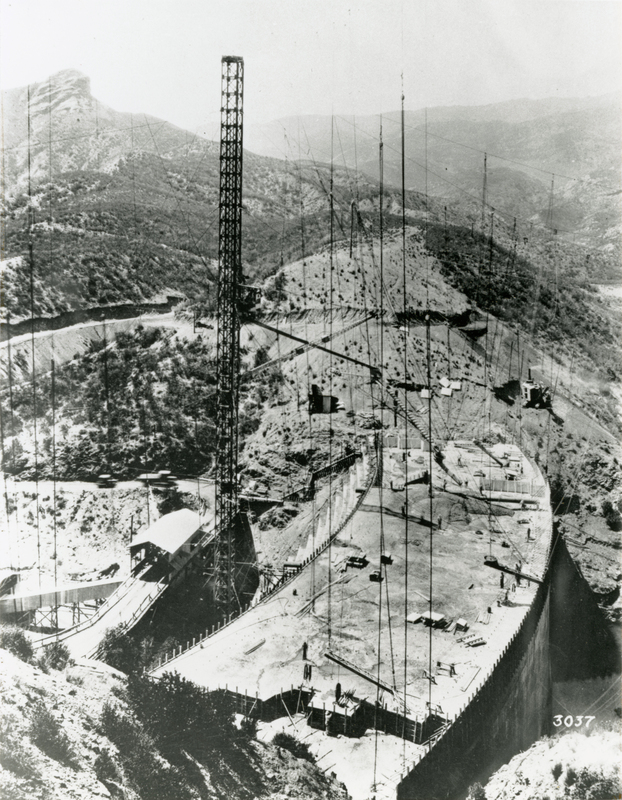 Two months later the dam was finished, at a height of 185 feet. The reservoir held 12½ billion gallons of water, about a year's supply for otherwise-dry Los Angeles. At 11:57:30 on the night of March 12, 1928, half of the dam suddenly collapsed. An immense wall of water rushed down the canyon at 18 miles per hour, totally decimating the concete-and-steel Powerhouse No. 2 hydroelectric generating station as well as the Frank LeBrun Ranch, the Harry Carey Ranch and Trading Post, and everything else that stood in the way. Floodwaters met the Santa Clara River at Castaic Junction and headed west toward the Pacific Ocean. The communities of Piru, Fillmore, Santa Paula, Saticoy and much of Ventura were leveled before the water, mud and debris completed their 54-mile journey to the ocean at 5:25 a.m. on March 13th. At dawn's early light, an estimated 411 people lay dead. Some bodies were buried under several feet of earth and were still being discovered in the 1950s. In fact, remains believed to be those of a dam victim were found in 1994. The disaster that ended the career of the famous engineer and DWP chief William Mulholland was the second-worst disaster in California history in terms of lives lost, surpassed only by the great San Francisco earthquake and fire of 1906. AP2331: 9600 dpi jpeg from copy print.